Designed to provide the ultimate stability and accuracy in table support and alignment. Slides into 510 worktable and extension tables to help support floating extension tables. Will not work on Mk V 500. Table or Extension Table to give you all the added support and control you could ask for when working with extra large or cumbersome workpieces. 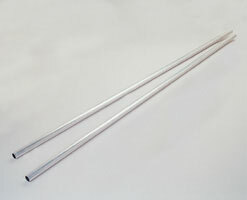 Made of rugged steel tubing, they're zinc plated to minimize the formation of rust or corrosion and have been designed to work with your existing Telescoping Legs and Floating Extension Tables. Will not work on 500.